The financial markets had been expecting dire payroll numbers, thanks to the huge snow storms that hit the East. I am going to go way out on a limb here and bet that the snow will be gone by June. In fact, without the snow, the February payroll number could have been as high as a positive 100,000, and that we may actually see this in the March figures to be released in a month. I think the current report is spectacularly good news, because it suggests that the rise in jobless claims is now at its apex, and is about to reverse and return to earth. Mind you, we aren’t going back to 5% unemployment anytime soon, but any number showing job gains will have a hugely positive psychological effect. It will be an improvement that the markets don’t expect, don’t believe in, and therefore will catch them seriously off guard. This means that the global risk reversal trade that started on January 11 may be over, and that big hedge funds are about to start adding on positions across the entire range of financial instruments. 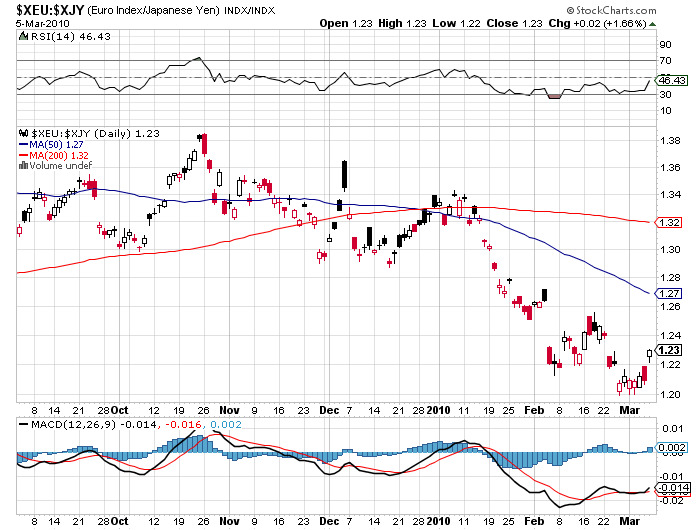 That great bell weather of global risk taking, the Euro/Yen cross is telling us as much, having popped from ¥120 to ¥123.5 on the payroll news. 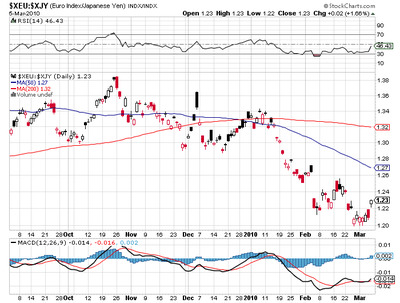 You also see this in the Ausie/Yen cross, and outright yen markets. Those who managed to catch my recommendation to short the yen at ¥88.40 on Thursday bagged an instant profit of ¥2. This is a trade that could go on for the next year, and you should be selling rallies in the Japanese currency from here. The mother of all carry trades has begun. This is good news for stocks and emerging markets. I’m not expecting anything dramatic here, maybe single digit gains in the indexes, and double that for single stocks. Use Apple (AAPL), Google (GOOG), and Goldman Sachs (GS) as your Sherpas, because they are the current markets leaders. Focus on big cap technology. It will also juice commodities, oil, and precious metals. These numbers put another nail in the coffin of the 30 year Treasury bond, which I have been despising all year.